Category: Where’s the good cake? August 23, 2007 August 23, 2007 Patrick Food, UK Life, Where's the good cake? I’m starting a new series of “Where’s the good…” focused this time on cake since there’s a handful of very nice places around town I think people should know about. One of these such places is Peyton and Byrne, located in the middle of the large building housing Habitat and Heals on Tottenham Court Road. The store itself is small compared to the two behemoths its nestled in, though it simple and clean presentation draws crowds to its wares. 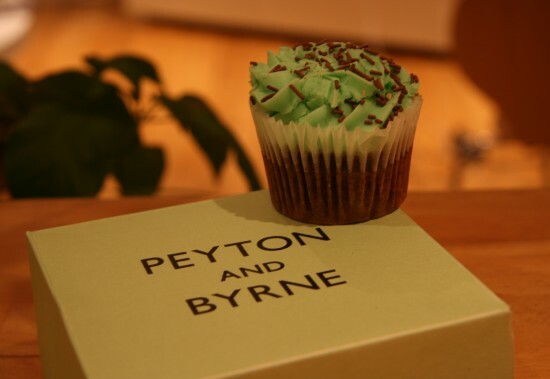 Peyton and Byrne offer much than cake, including biscuits, slices, tarts although on my visit I went for one of the small cupcakes in the window thinking it would give me a good idea of what they had on offer. Most of the cup cakes on display are based on a deep rich chocolate cake mixture, and covered in a huge amount of flavoured icing. The one you see in the picture above is the Mint Chocolate one. The cake was deliciously moist, and although the ratio to icing to cake is almost one-to-one, it somehow worked. I can definitely recommend one of these cup cakes though next time I would try one of the slices of cakes on offer. Leave a comment Food, UK Life, Where's the good cake?